But for now, I think they have become our new blocks. Look who dove in the moment the box was opened! Sorting heaven- a perfect math manipulative! First she sifted through looking for unique ones... then came classification time. It wasn't long before there was a run to the doll house for some props. We've left them out in the middle of the floor for continued play. Here's last night's impromptu Valentine's Day Tea of the feline variety... you can't imagine how tiny those hearts are! I see a super tall burlap bucket in my future... one to hold all of these new "wooden blocks". Fresh tools/toys our a perfect antidote to the February blahs. There seem to be enough to share (understatement of the year... holy moly, mom! ), so I'll let you know when I get to working with them, myself. Please share if you have any spool projects of your own! Have to admit I'm pretty jealous! All my sewing thread comes on plastic spools and if I want empty wooden spools, I have to buy them in the craft store. If you have too many you could always do a giveaway...! Amy- most of my spools are on plastic, too so I really appreciate these. The plastic ones make great printing and playdough tools... in their defense. My ideas definitely include sharing some. I still can't believe how many there are! i adore wooden spools. perhaps one day, when i'm a grandma, i box them up and ship them to my grand kids! there's a booth at a local antique mall that sells baggies of thread on wooden spools for $1.00 - i've treated myself to a few (ok, more than a few) baggies. OH! SO jealous! 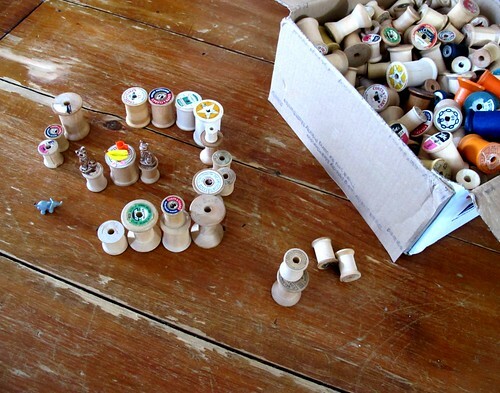 I love wooden spools...and, sure, you can buy some at the craft store...but ones that are vintage with the labels still on them are just magical. I was recently on a kick of buying photography prints of vintage spools of colorful thread from Etsy. My husband asked me "Why don't you just photograph your own?" and I said "Because I don't have vintage spools!" You're so lucky! Enjoy the spools! I would paint them, either all different colors or all white, and string them up into garlands. Pretty! You can also hang them from a ring in different lengths for a baby's mobile. You can group a few on a tray and put sprigs, branches, feathers, and flowers into the holes. Looking forward to seeing how you use them! It can be used as another children's toy. You just put a rubber band (an elastic) through and on each edge you put a toothpic. And then you turn the toothpich round and round so that the elastic gets twirled. And then let the spool go. My mother calls this a tractor. Fabulous, fabulous, fabulous ideas!! I'll definitely be trying some of them out. I just did a little experimenting that I can't wait to show you! The best toys are those that are not formally dubbed "toys." They can become anything the child wants them to become. My grandmother did alterations out of her home and I grew up playing with those! Neat idea! Such a lovely little tea party she created! Last year I was inspired by push pins attached to spools at pottery barn. I resisted buying them because I knew they would be more meaningful if I made them myself. I hope to find some at a sale sometime this spring. You are so lucky! I just adore wooden spools! How lucky you are! Glad to see those beautiful spools put to such good use. my mom also has a (much smaller!) collection of wooden spools and she has some in a jar on display and she also winds scraps of ribbon around them to keep them from getting tangled. And of course my boys love to play with them too. They like to build towers, thread them onto yarn, etc. I bet a few wooden dowels would be a great addition too. What a goldmine! the tea party is so sweet! I've been on the lookout for some of these to make some spin-y infant toys. We used to use the larger ones to make little knitting machines. you need a large drill bit (about 1/2 in diameter) to make the center bigger and then nail about 5 small finishing nails around the hole on one end and you're good to go! We made yards of i-cords this way and then sewed them together like a braided rug for dollhouse furnishings. My dad made me many of those knitting spools. I loved them! Run a piece of rolled up sandpaper through the hole until it is smooth so the yarn doesn't get caught on any splinters. I had some with only 4 nails, too. Wow, they look fantastic! Wooden spools are perfect for playing. They make good wheels for cardboard crafted cars and you can also use a spool as a sturdy 'handle' for a handmade stamp (instead of cork). I love old spoons, as well as old sewing thread. So pretty and often more sturdy than todays stuff! Wishing you a lot of fun with your treasure(s)! Thank you so much for all of the wonderful inspiration and directions for knitting spools. We have several wooden ones, but how fun to MAKE our own! Love the little tea party. I have a few old ones too, haven't really known what to do with them. I like the jar idea. My gran used to press a patterned end of spool into shortbread before baking, to make a design. Wow, how wonderful is that!! My daughter would have a field day with that treasure box!! OH what fun! I buy bags of these at the thrift store (I love to play too)! I'm thinking of a necklace rack or coat rack with them... saw it done online somewhere last year. When I was a little girl my great grandma had some old wooden spools in a green wooden tote. Whenever we visited it was to these that we all gravitated. My cousin now has the spools and my aunt the tote. My grandmother (my great's daughter) gifted me a box handmade by my grandfather that is full of wooden spools. These are now being played with by my boys. Such wonderful memories! I've been meaning to take pictures of them. Thanks for the reminder. I just read a cool use for these in "Green Crafts for Children." You can put in 4 tacks, and make a French Knitting thingy (pp.121-123). That only takes care of one of them, but maybe you could make b-day gifts for little friends? as a girl, i always had two wooden spools by the front door of my dollhouse...they made great planters and i was diligent about changing out the greenery every day. such a bountiful gift!! i'm sure you and your kids will have hours of creative fun. The plastic ones make great printing and playdough tools... in their defense. My ideas definitely include sharing some.I could make mini vases out of them. We covered them in fabric and ribbon and such (they were plastic spools afterall (if they were wood I think I would leave them or maybe stamp them? I love the texture of wooden spools. Apparently, so does your daughter. Sweet tea party. It's also nice to know that someone else will leave the toy of the moment on the floor in its place until play time the next day. You can use them as handles for your homemade rubber stamps--just glue the stamp to one end of the spool. You could even make a rolling stamp for borders by covering the entire side of a spool with a stamp. Put a pencil or dowel though the middle and you can roll it along the paper. My grandmother used wooden spools to get us kids to actually get clean in the bathtub. If you rub soap on yourself, say your leg, then rub the end of a spool on your soapy leg you can blow bubbles. I have recently made spool knitters out of wooden spools for a recycling project at my children's school. Crochet cotton works well in the tiny hole. When my children were young I made a snake head out of a large wooden bead, attached a shoe lace, and they would string on smaller wooden spools to make a snake. I also have some that I turned into little mushrooms with a felted wool top. Thank you all for sharing so many wonderful stories and fantastic ideas! Stamping began yesterday... blowing bubbles in tonight's bath! wow, your mom had skads of old wooden spools. very cool! 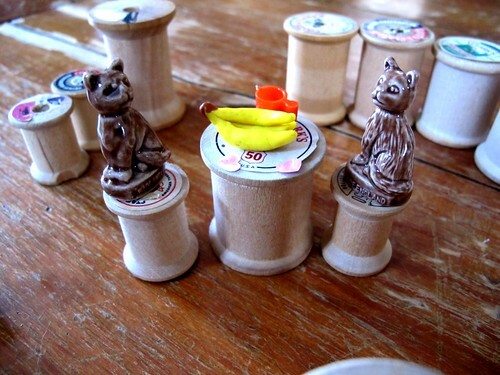 I haven't seen so many small wooden spools since i was little when my mom sewed. Such fun for your little ones. Looking forward to seeing the new basket you will create to hold them. 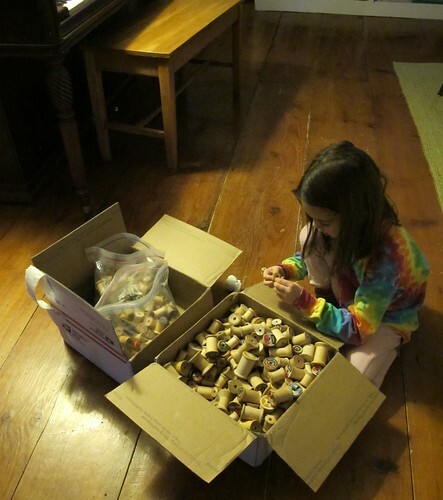 My grandma had a whole box of old wooden spools, chess pieces, and dominos that we used as blocks. I wish I had them still! Wow, a lot of spools. I love kids imagination. I often wonder where some it goes when most people grow up. Thankfully some of us keep it. Thanks for sharing. Can't wait to find out how you use them in your projects. Hi Maya, this is so inspiring! 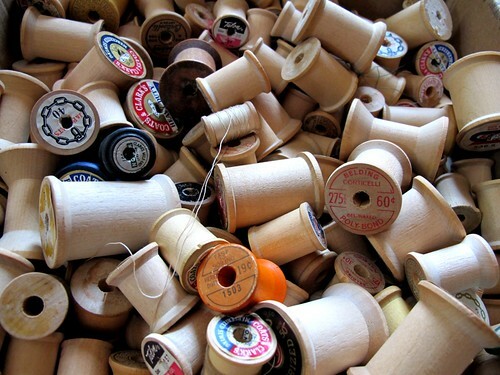 I admit I have an obsession with wooden spools but unfortunately my collections is too small! I made tree ornaments with them this holiday season by stringing yarn through the holes. Currently I display them in a wooden type drawer. I always draw inspiration from them for my jeweler making... in the past I have made spool earrings and even a spool ring. The tea party is so sweet, I just love watching how children's imagination unfolds during play. I would love to play with all of those! Nothing like REAL toys that cause the imagination to be worked! Our kids played with wooden blocks that were considered seconds, from a factory in Kansas. They were rounded at the corners, but they made them work and enjoyed them. I collect buttons and my girls would just *stir* them. I made a toy iron using one that I found in the sewing table that I inherited from my grandmother. I've only got a couple more, but that huge quantity of them looks SO fun!